Using two fingers and lots of white-out, he religiously typed five pages a day throughout college and well into his twenties. Then life intervened. 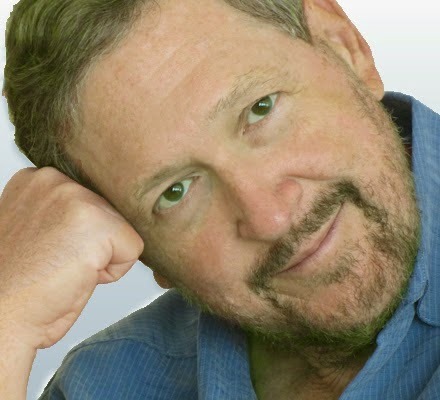 He paused to raise two sons and pursue a career, in the process becoming a well-known entrepreneur in the software industry, founding several successful companies. When he found time again to daydream, the urge to write returned. His novels include: There Comes a Prophet, Along the Watchtower, and the newly released The Daughter of the Sea and the Sky. I’m the once and future writer. I started writing when I was seventeen and worked at it into my late twenties when family and career intervened. I never thought I’d go back to it. But after a thirty year hiatus, it just happened. I began thinking up stories and, the next thing I knew, I was writing again. Watching readers immerse themselves in the story and come to believe that it’s real. I find nothing more satisfying than listening to others comment about my characters as if they actually existed. While writing a novel, I get very attached to my characters. They become like family. And so I love it when others get to meet them and know them as well. Tell us about your currently available titles. My first novel, There Comes a Prophet, is dystopian fiction. Unlike the latest batch of dystopians like the Hunger Games, it’s not about an oppressive dystopia, but rather one paved with good intentions. The word dystopia is derived from dysfunctional utopia—a world where idealists trying to make things better have made them horribly worse. Along the Watchtower, my second novel featured on this tour, is a mainstream fantasy about an Iraq war veteran from a troubled family background, who has been severely injured in an IED attack. Prior to the attack, he coped with tragedy and hardship by playing World of Warcraft every chance he had. Now, suffering from traumatic brain injury and PTSD, he lapses in and out of a dream world like in the fantasy game. But unlike the video game, his quest is not for gold or a higher level, but to find a reason to live. My most recent effort, The Daughter of the Sea and the Sky, just came out in May. It’s about a world divided between the Blessed Lands, a place of the spirit, and the Republic, whose people worship at the altar of reason. A mysterious nine-year-old girl from the Blessed Lands sails into the lives of a troubled couple in the Republic and changes everyone she meets. She reveals nothing about herself, other than to say she’s the daughter of the sea and the sky. But she harbors a secret wound she herself cannot heal. Readers can learn more about my books at www.davidlitwack.com . Do you have any projects currently in the works you want to talk about? I’ve decided to make There Comes a Prophet a trilogy and am currently well along on the second book. What do you hope readers gain most from your work? People read for many different reasons. The reaction I hope for most is that, , they’ve stir up strong emotions through identifying with my characters. I hope they can relate something in my story to their own lives, but in an intense way. 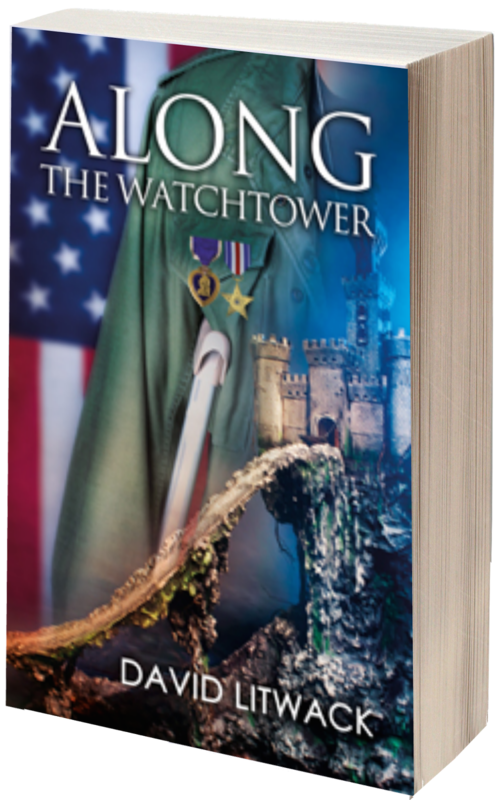 One reviewer of Along the Watchtower wrote that it brought back memories of being a young college student, witnessing the twin towers fall on 9/11. The book touched him deeply, because it reminded him that, as a result of that tragic event, we’ve been at war his entire adult life. The shock he felt on 9/11 all came back to him in reading the struggles of the recovering Lt. Freddie Williams. What's your reading pet peeve? As in, the thing that happens in a book that instantaneously drives you crazy? I least like characters who suffer from deep angst but have no goal or purpose. You might get some wonderful writing about their inner thought s and being, but you’re unlikely to find them at the center of a good story. What's your reaction when someone tells you, "I want to write a novel"? If you don’t love it, find something easier to do. Are you a plot/outline writer, or by-the-seat-of-your-pants writer? I usually conceive of a new book as a series of images and scenes, daydreaming about them while I finish work on the prior novel. I maintain a file for the new novel and do a rough draft of these scenes—a very rough draft, what some people call “riff writing” like improvisation in jazz. The file can get pretty chaotic. Every now and then I make a feeble attempt to organize it (when I’m finishing up a novel, I try to avoid distractions and stay focused on getting it out to the publisher). By the time I’m ready to start the new novel, I usually have about 20,000 words of loosely connected prose—20-25% of the eventual novel but probably 80% of its essence. I take a couple of months to read, edit and organize that file into a dense plot outline. Then I start a new file from scratch, cutting and pasting prose as appropriate. It’s a pretty messy process. I have days when I wish I spent more time upfront getting organized. But unlike those who start with an outline, I need that amount of writing to get to know the characters and live in the story. How do you tackle writer's block? No writer sits down and has words flow freely while writing an entire novel. I sometimes wander down plot paths that get me in trouble, so I have to back up and start again. I force characters to do things that are against their nature and they rebel. At a certain level, the novelist’s challenge is to be absolutely clear what he’s trying to say. The problem is that when we stare at a blank screen initially, it just isn’t that clear. I try to have the mindset that there will be lots of drafts, that with each, I’ll better understand the characters and the story. When I get stuck, I go back to basics: what do the main characters want? What’s stopping them from getting it? How will they overcome the current obstacle and move on to the next, greater obstacle until they either achieve their goal or realize it’s not what they really wanted. If I’m having trouble seeing the story clearly, I’ll take a break, read, or go for a long walk. Occasionally, I need to set the project aside and work on something else for a while, until I can gain a fresh perspective. The worst thing a writer can do is sit there and bang his head against the screen.